Is virtual reality finally ready for business use? The head of partnerships for Google Cardboard says compelling content will ultimately make virtual reality succeed, and he encourages innovative individuals to get going on creating immersive and unique VR experiences. BEVERLY HILLS, CALIF. — The technologies that let people use their smartphones as virtual reality (VR) viewers are rapidly evolving. The VR content, however, is a big missing piece in the puzzle. Without compelling content, users have little to watch, and they are unlikely to get excited about VR until the situation changes. Luber thinks creative individuals will play significant roles in the future of VR, but he wouldn't offer suggestions on the types of content they should imagine and eventually create. "I tend to shy away from content questions only because I don't know," he says. "I don't want to hypothesize on what I think is going to be useful and important. We are all brand new to this thing … we are all experiencing VR and getting into this for the first time." Google doesn't want to put any restrictions on VR, and it is hoping this openness draws the kinds of inventive people it needs to develop the medium. "I'm just eager to see more creative people, not me, come out and do a lot of cool stuff that will start unearthing those things people want to see and do," he says. "I think we're going to see a lot of great things happen." Google Cardboard has been available for almost 18 months, but the low-cost VR viewer stands to see its most significant boost this Sunday when The New York Times ships more than 1.3 million units to subscribers. The newspaper developed a 360-degree documentary film titled "The Displaced" about three children uprooted by war, and it plans to add more content during the coming months. 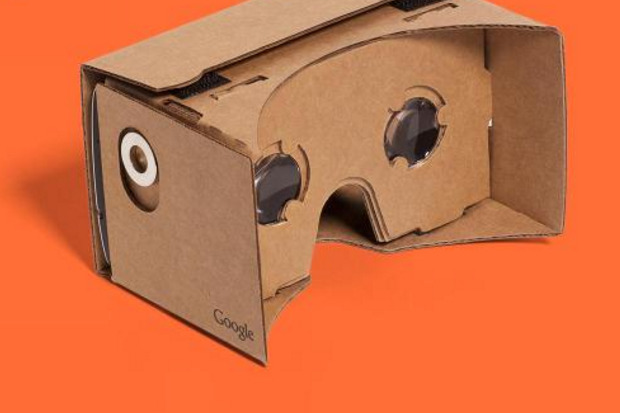 Companies are also embracing Cardboard, which costs Google just $4 to manufacture in bulk, as a tool for marketing, entertainment and education. For example, Volvo handed out more than 10,000 Google Cardboard units at last year's Los Angeles Auto Show, to highlight features of its XC90 model. Legendary Pictures distributed 50,000 units to promote its upcoming film "Warcraft;" AT&T handed out 100,000 units for its "It Can Wait" anti-texting-while-driving campaign; and Google gave out 20,000 units at the Sundance film festival. Google Cardboard is open source, and the company has 15 approved partners on board today, though more than 100 companies currently manufacture their own versions of the viewer, according to Luber. Google says VR is the future of computing. Its approach, however, is notably different than the other players in the space, with much lower barriers for adoption. "Our mission is to deliver VR to the masses," he says. "The reason we're doing this is not an entertaining thing, it's not a gaming thing… This is an evolution of computing." It will take a while for VR to hit its stride, according to Luber, but Cardboard and other viewers, such as Oculus Rift and Samsung Gear VR, show real potential and will continue to gain traction.